This past weekend, Compete hosted several Street Fighter pros and commentators at our offices for a public event where fans could sign up to battle against top SFV players. Since we had this all-star roster of Street Fighter aficionados hanging out at our offices, the Compete staff pulled them aside to preview the Nintendo Switch version of Ultra Street Fighter II, which won’t be released to the public until May 26. They liked it. We propped up the Nintendo Switch on a countertop and booted up a local versus match using the two Joy-Con controllers. Setup only took a minute, and the game ran like a charm on the Switch screen. We tapped Street Fighter commentator James Chen to give the game a look, since he got his start in the scene by competing at Street Fighter II in the mid-90s. 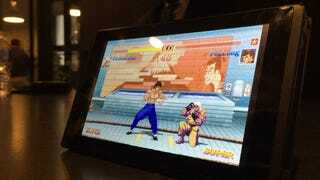 This Nintendo Switch version of the game is based on Super Street Fighter II Turbo, which Chen told Compete is his preferred version of the game. The Switch version of the game does have some notable differences from Turbo, such as the addition of grapple breaks, as well as the inclusion of Evil Ryu and the addition of a brand new character, Violent Ken. James Chen went straight for Violent Ken as soon as he got his hands on the Switch Joy-Con. His opponent, Street Fighter V pro Du “NuckleDu” Dang, said he had never played Street Fighter II Turbo before, although he did claim to have played Street Fighter II at least once. 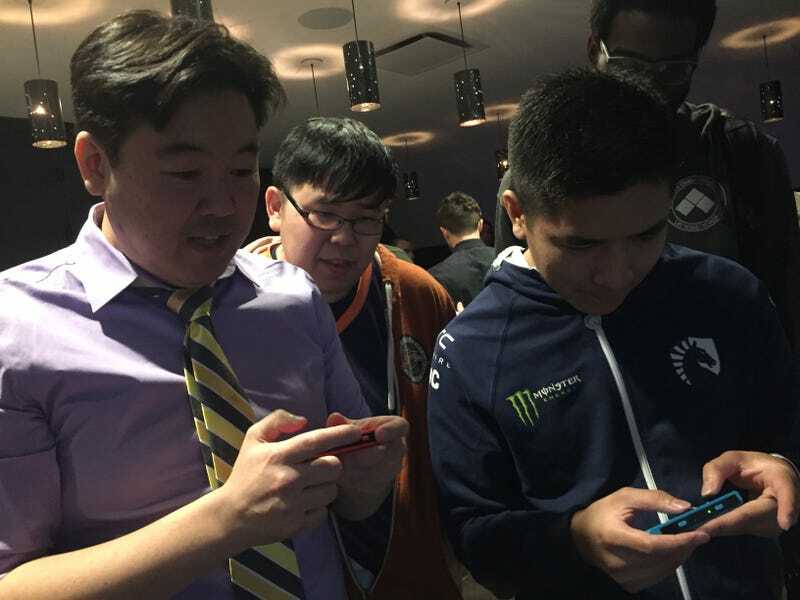 Before the match, Chen pointed out that Street Fighter II came out before NuckleDu was even born. This is no exaggeration: SF2 came out in 1991, and NuckleDu wasn’t born until 1996. James Chen won two rounds in a row against NuckleDu. Then, Justin Wong popped by to check out our set-up, exclaiming in disbelief: “This is kinda crazy. You can play Street Fighter II on the Switch!” He stepped up to face off against Chen, and this time, Chen switched characters to Fei Long. 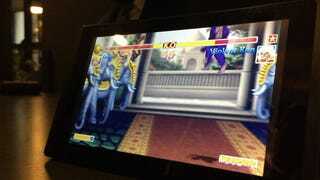 Wong gave Violent Ken a try. “I think the game plays really well on [the Switch],” Wong elaborated, “But with these Joy-Cons, it’s really hard to play Street Fighter. It’s a six-button game.” The Joy-Con shoulder buttons in particular are “really hard buttons,” but according to Wong, the four face buttons are “really responsive and easy to do.” Wong hadn’t yet had the chance to try the Nintendo Switch fight stick, but he did put in a recommendation for the Switch Pro Controller as his current go-to for the system.